Thousands of people wearing red suits, elf getups and reindeer costumes are expected pack more than a dozen Dupont Circle bars during a holiday-themed pub crawl this weekend. 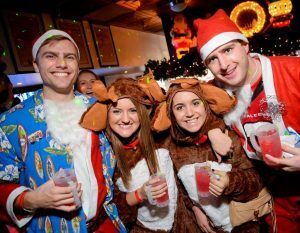 This year’s “Santa Crawl” takes place Saturday, Dec. 10., from 2-10 p.m.
“Participants are encouraged to dress in whatever best expresses the holiday season, whether it be a full-body candy-cane suit, a snuggly turtleneck, or tinsel-streaked hot pants,” organizers wrote on the bar crawl’s website. Tickets cost $30-40 and get attendees a “refillable signature Santa mug,” drink specials and entry into a raffle.